What makes a company an employer of choice? Based on over 15,000 employee interviews, this report contains detailed results and individual employer data for over 950 UK employers. For the first time Statista.com, in partnership with Bloomberg, surveyed over 15,000 UK employees in order to analyse the best employers in the UK and understand what drives UK employee satisfaction. If you would like to order the report without registering with us click here. 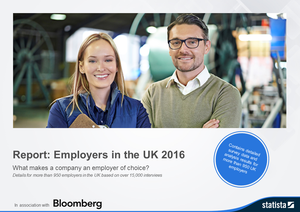 For the first time Statista.com, in partnership with Bloomberg, has surveyed over 15,000 UK employees in order to analyse the best employers in the UK and understand what drives UK employee satisfaction. Using online access panels, Statista.com and Bloomberg have anonymously and independently surveyed over 15,000 UK employees. Based on the results of this survey over 950 employers from 25 industry sectors have been given a score. The report contains 3 documents: a clearly structured PDF presentation of the results from all examined industries and two comprehensive Excel sheets containing both company and industry data. The PDF presentation contains an analysis of results laid out in a professional and easy to read format, using graphical representations. In addition to the employer’s individual score and ranking, drivers of an employer’s attractiveness are analysed and ascertained for each of the 25 industry sectors and sociodemographic groups, etc. Furthermore, based on the in-depth driver analysis, the document contains recommendations to increase employer attractiveness. The first Excel document contains all individual scores, driver values and additional information for over 950 employers. The second Excel document contains all 6 driver values for sociodemographic groups (age, gender, level of employment, etc.) and for each industry sector. The reading aid contains an overview of the results included in the report and an overview of all surveyed employers.